15 LISTS Violence in the MediaLists about the goriest, bloodiest, most shockingly violent scenes and moments in film, TV, comics, graphic novels, and even children's cartoons — because in today's world, kids can see anything as long as it's not a bare breast. Some movie spectators love violent movies simply because they're violent. However, there is a segment of the population that cannot stomach any form of cinematic violence; it makes them nauseous and uneasy. This list is designed for them. Why should film fans miss out on good violent movies just because they're squeamish? Here are some violent movies everyone can enjoy. Quentin Tarantino is known for making violent movies. However, many of his films, like Pulp Fiction, adeptly use his signature style of mixing violence with humor. We laugh at things, like a car covered in blood and filled with brain matter, that we normally would not find funny. This list of bloody films represents all genres from classic horror to crime to war. Even if these movies are filled with violence, it's not necessarily what makes them works of art. The Godfather is much more than gangsters battling over territory, just like Hacksaw Ridge is not just a movie about the graphic battles of World War II. Those pictures are not just violent for the sake of violence, there is heart to them, and cinematic technical excellence. Check out those violent movies for squeamish people and more in the list below. The mafia classic set the standard for all crime films that followed. Francis Ford Coppola's epic tells the tale of the Corleone family, led by patriarch Don Vito (Marlon Brando) and his sons (Al Pacino, James Caan), as they navigate their way through a power struggle with four other mafia families. Of course, there is violence in The Godfather (1972), but it never comes off as overtly gratuitous. It also happens to be one of the best movies ever made, with some of cinema's finest acting performances. It's a sweeping saga, a love story, and a revenge tale. And it features one of the most memorable movie juxtapositions ever: during the climactic final act, while Don Michael (Al Pacino) is baptizing his first son, Coppola cross-cuts with Don Michael's men setting up and ultimately killing the other four family heads. It is a cross between religion and death, fantasy and reality, and the world Michael wishes for his son with the world that he actually lives in. It's a violent scene for sure, but it's also a big part of what makes The Godfather a masterpiece. Post-modern masters the Coen Brothers combine neo-noir with the western in their adaptation of Cormac McCarthy's 2005 novel of the same name. A hunter named Llewelyn Moss (Josh Brolin) finds a briefcase full of cash out in the desert following a drug deal gone wrong. What Moss doesn't know is that the man looking for the money, Anton Chigurh (Javier Bardem), is a heartless badass intent on tracking down the briefcase. Tommy Lee Jones plays the close-to-retiring Sheriff on the trail of both men. The story cross-cuts between the three characters as good, evil, and somewhere in the middle get set to collide onscreen. 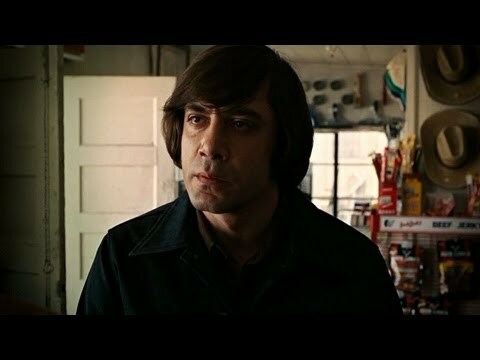 Spectators should know up front that No Country for Old Men is a violent film and its antagonist, Chigurh, even with his little-boy bowl haircut, is absolutely terrifying. However, the violence in the film is necessary for telling the story. The movie is commenting on the cruelty and brutal nature of the world. There are very few technically perfect films, but No Country for Old Men makes that short list. The writing, cinematography, sound, acting performances, directing, and editing is all top-notch. It's no surprise that the movie won four Academy Awards in 2008: Best Picture, Best Supporting Actor (Bardem), Best Adapted Screenplay, and Best Achievement in Cinematography. Tony Kaye's 1998 drama about a neo-Nazi looking for redemption was heavily criticized for its use of extreme violence. One of the most troubling scenes for audiences to swallow was the infamous curb scene when Derek (Ed Norton) forces a black man, whom he had just caught vandalizing his truck, to open his mouth and place his teeth on a curb. Derek then smashes the man's head into the curb while his little brother Danny (Edward Furlong) watches from afar. But here's the thing about this scene: we see much less than we think we see. Derek kicking the back of the man's head is filmed in extreme long shot, and then there is a quick cut back to Danny. Our minds paint the picture of what the camera doesn't show. American History X certainly has its fair share of violence, and it is disturbing because it feels so real, especially in light of the racial tension that still plagues the world today. However, in between the four or so really violent scenes in the film, is a basic family drama of a close-knit group just trying to survive in a community filled with hate. It's easy to forget those heart-warming family moments, but they are there, and it makes American History X so much more than just a violent movie. 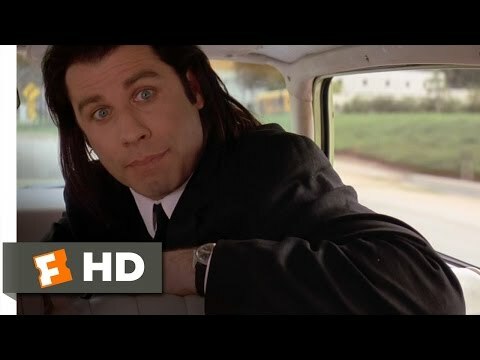 There's a scene in Quentin Tarantino's Pulp Fiction (1994) where gangster Vincent Vega (John Travolta) is riding shotgun in a car being driven by his partner Jules Winnfield (Samuel L. Jackson). Riding in the backseat is an accomplice named Marvin. The men have just retrieved a briefcase for their boss, and somehow, by some miracle, escaped being shot to death. As the two hit men are debating whether they survived because it was an act of God or some freak accident, Vincent turns to Marvin in the backseat to ask the young man what he thinks. But Vincent has a gun in his hand and it mistakenly goes off. Vincent dumbly says, "Oh man, I shot Marvin in the face." The audience instantly erupts with laughter as blood is piled up everywhere in the car and bits of Marvin's brain matter hang from Jules's hair. So why is this violent scene so damn funny? This is Tarantino's trademark paradox and what makes so many scenes in Pulp Fiction so memorable, he is able to effectively blend violence with humor. The director has stated that one of his goals as a filmmaker is to get people to laugh at things that they normally would not find funny. So while Pulp Fiction may be riddled with violence, much of that violence is surrounded by laughter, and it makes the gore so much more palatable, even for the most queasy spectator.